Watch the DP Football vs. Lawndale CIF Game #1 Live! 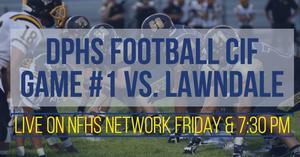 Watch DP Football's first round of CIF game vs. Lawndale live on the NFHS Network, broadcast by DPNews. Find the link by clicking the title link. If you click the subscribe button on our school's NFHS page, all proceeds will go to our school. Seniors ~ Herff Jones representatives will be on campus this Friday, October 26th to take cap and gown orders. Please look for them outside the Athletics’ Office during lunch. Price is $25. Order now before the price increases! 9th - 11th graders still needing to take a school photo should plan on heading to the Cafeteria on Friday, October 12th. Lifetouch will be on campus from 7:30 am through lunch. Alumnos en los grados 9º al 11º que aún necesiten tomar su foto de la escuela deben presentarse en la cafetería el viernes 12 de octubre. Lifetouch estará en el campus desde las 7:30 am hasta el almuerzo. 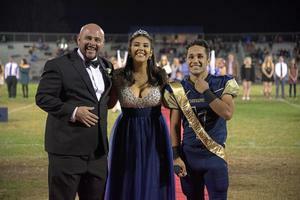 Homecoming tickets now available online. If you are a DP student NOT bringing a guest from another school, you may purchase your dance ticket online. to Mrs. Hemsley/Mrs. Irwin's office in the Admin building. No exceptions. Back to School Night Information / Noche de Regreso a la Escuela - Wednesday, September 5 at 6 p.m.
AUDITIONS for DP's Fall Show "Twelve Angry Jurors" are Tuesday, August 28 from 3 - 6pm. Interviews for backstage crew will be Wednesday & Thursday, August 29 & 30 from 3 - 5 pm.